In the second decade of the Twentieth Century, the First World War took the harsh realities of human conflict to a new level of destructive intensity. The Crimean War (1853-56), the American Civil War (1861-65) and the Boer War (1899-1902) had already provided a foretaste of what modern, mechanised warfare might involve, and were also among the first major conflicts to be documented in the relatively new medium of photography. 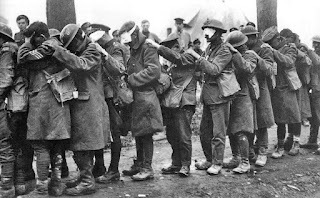 Now, in 1914, the German biologist and philosopher, Ernst Haeckel, predicted that " ... there is no doubt that the course and character of the feared 'European War' will become the first world war in the full sense of the word." The First World War would be truly global, perhaps to an extent that even Haeckel could not have predicted. It would involve seventy million military personnel, and claim the lives of nine million of these, together with seven million civilian fatalities. It shattered forever the notion of "inevitable progress," which had been such a fundamental part of the Nineteenth Century world view, both in Britain, and in the United States. A Bristol F2 in action over the Western Front in 1917 (image is in the Public Domain). 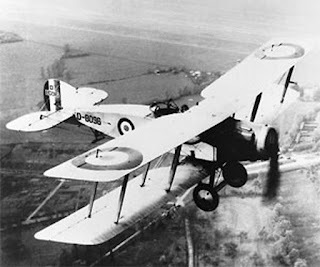 It was the first war in which aircraft played a significant part, and the first in which poisonous gas was used (despite this being contrary to international protocols previously agreed between the very parties that were now using them). It was the first major conflict to be systematically captured in moving pictures, as well as in still photography, and, thanks to subsequent developments in television, in an age when many survivors of the conflict were still alive, the first to be examined retrospectively through the art of the documentary film-maker. 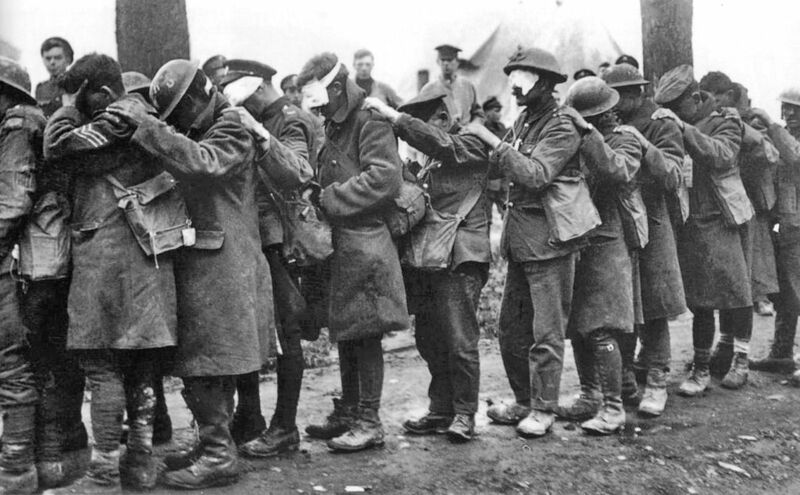 British troops blinded by a gas attack at Estaires, 1918. Photo: Second Lt. Thomas Keith Aitken, Imperial War Museum Q11586 (image is in the Public Domain). A collective loss of innocence was involved - warfare was no longer something that took place far from the public gaze, its sanitised stories presented on the heroic canvases of the history painters, and in the verses of poets such as Tennyson. It became, first, unacceptable, and then straightforwardly impossible, for the public to avert their eyes. 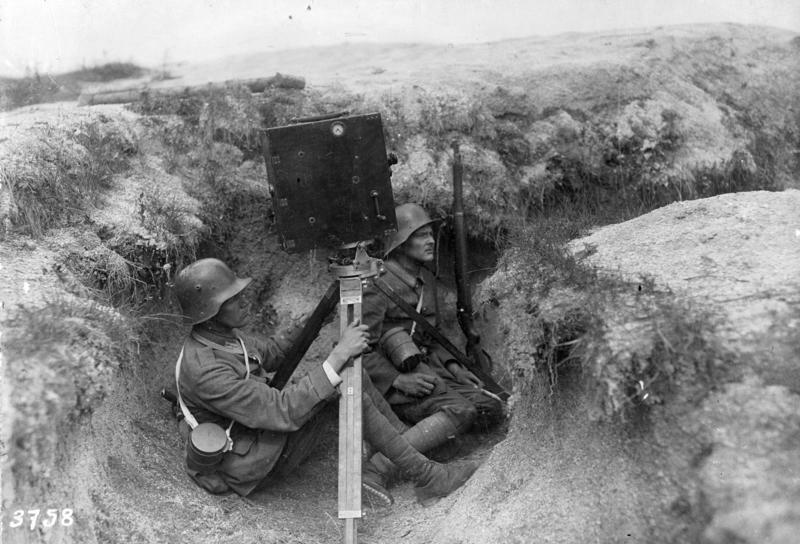 A German film crew in the trenches, 1917. Photo: German Federal Archive Bild. 183-1983-0323-501, CC-BY-SA 3.0. To choose just one novel to represent the First World War was a difficult task (one could more easily choose fifty novels to tell this one story, although that's a task for someone other than me). I eventually opted for The Ghost Road, by Pat Barker, itself the third volume of a trilogy, preceded by Regeneration and The Eye in the Door. 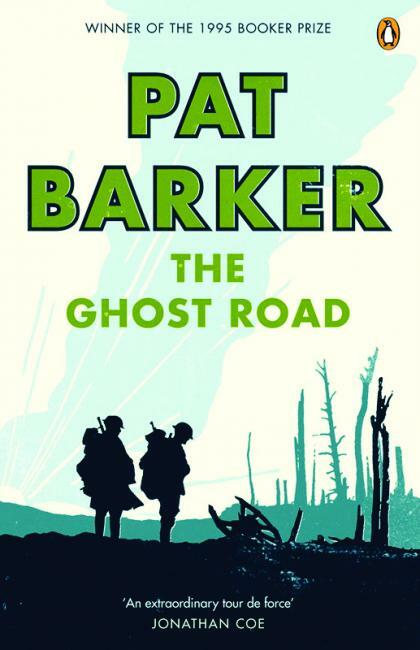 Like E.L. Doctorow in Ragtime, Barker combines fictional and historical characters. Her main protagonist, the fictional Billy Prior, is a man from a working class background who has risen into the officer class. Sent home with "shell-shock," he is treated at the military hospital of Craiglockhart, by the (historical) psychiatrist, William Rivers, and now wants nothing more than to return to his men. Craiglockhart, now a campus of Edinburgh Napier University. Photo: Brideshead (image is in the Public Domain). 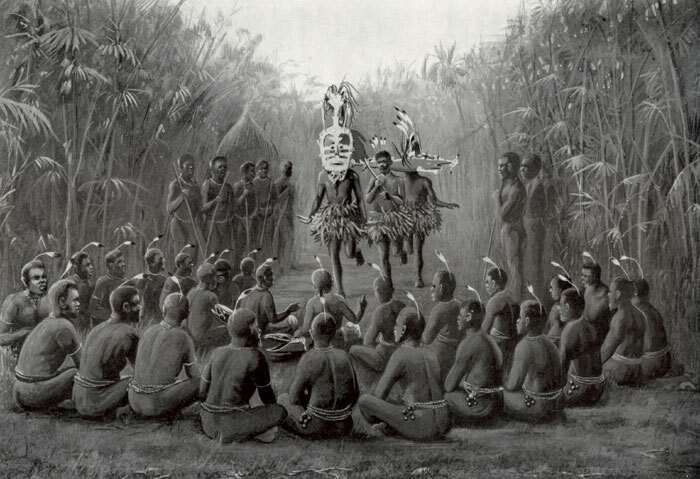 Rivers, meanwhile, thinks back to his happier days as an anthropologist, studying the culture of the Torres Straits Islanders at the turn of the century. He had been brought up to think of such people as "savages" (his Uncle James [Hunt], indeed, had been the racist, pro-slavery founder of the Anthropological Society), but now, looking back, he realises that he and his patients are caught up in a savagery of a far greater order than had ever existed among tribal people. Members of the Cambridge University Torres Straits Expedition, 1898. 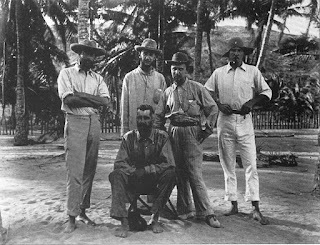 Rivers is on the left, and the seated man is the expedition leader, A.C. Haddon (photo, Cambridge University Museum of Archaeology and Anthropology - image is in the Public Domain). "How appallingly random it all was. If Hallet's father had got a gleam in his eye two years later than he did, Hallet wouldn't be here. He might even have missed the war altogether, perhaps spent the rest of his life goaded by the irrational shame of having escaped. 'Cowed subjection to the ghosts of friends who died.' That was it, exactly, couldn't be better put. Ghosts everywhere. Even the living were only ghosts in the making. You learned to ration your commitment to them. This moment in this tent already had the quality of remembered experience. Or perhaps he was simply getting old. But then, after all, in trench time, he was old. A generation lasted six months, less than that on the Somme, barely twelve weeks. He was this boy's great-grandfather." "Njiru's grandfather, Homu, was famous for having taken ninety-three heads in a single afternoon. Through his grandfather he was related to Inkava, who, until the British destroyed his stronghold, had been the most ferocious of the great head-hunting chiefs of Roviana ... The blowing of a conch, he said, signifies the completion of a successful raid. He turned and looked directly at Rivers. The widow of a chief can be freed only by the taking of a head ... Head-hunting had to be banned, and yet the effects of banning it were everywhere apparent in the listlessness and lethargy of the people's lives ... This was a people perishing from the absence of war ... Against the background of such despair, might not the temptation of taking one small head in honour of a dead chief prove irresistible? ... Rivers ate the baked yams and pork offered to him ... Once he looked up to see Njiru on the other side of the fire ... and surprised on the other man's face an expression of bitterness? No, stronger than that. Hatred, even." A ceremony of the Torres Straits Islanders, photographed by A.C. Haddon (image is in the Public Domain). A brief personal post-script. At Cambridge, I was taught by Professor Glyn Daniel (1914-86), whose many anecdotes included some about William Rivers (1864-1922), still widely remembered at St John's College when Glyn was a student and, later, a fellow there. Rivers, in turn, as Barker makes clear, had personal anecdotes to tell about Lewis Carroll (1832-98). Only four or five further links of this sort would be required to connect me to the time of Shakespeare: "generations" have never been a fixed currency.